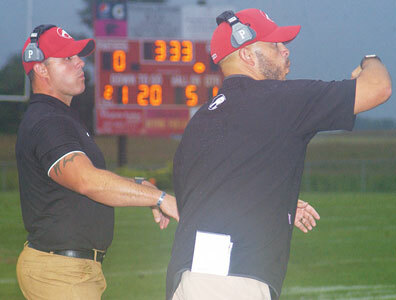 Fairbanks head football coach Patrick Cotter (right) and assistant coach Mark Sullivan signal in the defense last week against Greenview. The Panthers will travel to Madison Plains on Friday. A Madison Plains football team that likes to rely a lot on the ground game will host the Fairbanks Panthers for the fourth week of the 2018 high school season on Friday. The Golden Eagles (0-3) will operate out of the Wing T and feature quarterback Jarrett Vallery and running back Kosta Xenikis. The duo operates behind what Cotter describes as an “old-school, Marysville High School-type of offensive line. The Eagles will employ one tight end and one wingback most of the time. “They run a lot of off-tackle and buck sweep stuff,” said Cotter. A predominate running game shouldn’t bother Fairbanks’ defense all that much. “We’ve seen a little bit of everything this year,” said Cotter. The Golden Eagles have used both four-man and three-man defensive fronts this season. One of the problems is that Plains has a good many players going on both offense and defense. “I think just about everyone but the quarterback plays on defense as well,” said Cotter. That could wear down the Eagles in the latter stages of the game. Still, the Panthers have to be concerned with Plains’ defense. “They are going to blitz a bit from different directions,” he said. “They’ll come at you from both the inside and outside. Cotter said the Panthers’ offensive line must take care of business. The Panther coach feels the game will be decided in the trenches. “We have to control both lines of scrimmage,” he said. “If we do that on offense, I think that will allow our playmakers to get into space. Friday’s game will be the second contest in which senior quarterback Jacob Nicol will be back at full strength. It took Nicol one half against Greeneview last week to shake off some of the rust after being out since the preseason with a knee problem.